Doug McReynolds, set up our investigation at the Burlington County Prison in Mount Holly New Jersey. Team members traveled from 2 other states to check out what would turn out to be one of the most haunted prisons in the country!!!. Eastern State Penn. 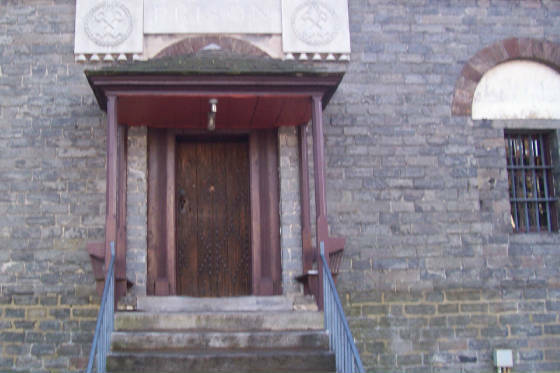 might be more well known, but this is the paranormal gem of the east! We would like to thank Ron and Marisa for letting us come investigate such a historic landmark and one of the most haunted places we have been to! The prison was a huge success and we gathered alot of evidence, including what appears to be blood on the floor that traces back to a murder that took place in the prison basement. Our entire team enjoyed our night in the prison, we are still shaking our heads! Burlington County Prison Museum is a national historic landmark located in the heart of historic Mount Holly , New Jersey . Designed by Robert Mills, one of America 's first native-born and trained architects, the Burlington County Prison was completed in 1811. As one of Mills' first independent architectural designs, the interior vaulted ceilings of poured concrete and brick and stone construction made the building virtually fireproof. Not only is the structure well suited to its purpose and virtually maintenance free, it also incorporates the philosophies of penal reform that were advocated during the period. In short, this structure was a fine example of innovative interior planning, fireproofing, heating and ventilation systems and the growing notion of social responsibility to rehabilitate criminals. In fact, it was so well constructed that it remained in constant use until 1965. As you tour this museum we remind you that this building was a prison for 154 years…at the time of its closing it was the oldest continually used prison in the United States . No mean feat for any building! CLICK ON FRONT DOOR FOR SITE INFO!!! WE would like to thank Marisa and Ron for kindly allowing us to share in the history of the prison and Mount Holly. Burlington county was founded in 1677. So the land has witnessed many struggles down through time and has accumualted many souls. We are here to help bring Burlington Prison and Burlington County the recognition it so deserves. We are honored to be a part of the ongoing history to preserve it for future generations. Remember, ghosts were people too! Robert Mills (1781-1855) was born in Charleston , South Carolina to a well-established Scottish family that settled there in 1770. One of six children, Mills was singled out early to follow a professional career and completed his classical course of study at Charleston College in 1800. His interest in architecture was probably developed and influenced by his architect uncle, Thomas Mills of Dundee , Scotland and his contact with the noted English architect James Hoban, who lived in Charleston during Mills' college years. In fact, Mills began his formal training as a draftsman under Hoban who was then working on the Capitol building in Washington , D.C. In 1803 Mills drew the attention of President Thomas Jefferson who asked him to assist in the design of Monticello , Jefferson's plantation home in the foothills of Virginia 's Blue Ridge Mountains . He resided there for two years during which he developed a very deep friendship with Jefferson . With letters of introduction from Hoban and Jefferson, Robert Mills began practice in 1805 under Benjamin Latrobe, the celebrated English-born architect responsible for, among other projects, the interiors of the U. S. Capitol. Mills continued under Latrobe until 1808 when he struck out on his own in private practice. During this period (1808-1830) Robert Mills married and moved to Philadelphia , Baltimore , Charleston and finally settled in Washington , D.C. 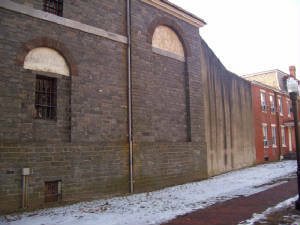 It was during his tenure in Philadelphia that Mills was awarded the commission to design the Burlington County Prison that was constructed in 1810-11. The building was one of Robert Mills' first designs as an independent architect and is a fine example of his ability to identify and solve some of the most difficult structural, safety, and utilization issues of the day. In 1836 President Andrew Jackson appointed Mills to the position of Federal Architect and Engineer. During his 16-year tenure he played an essential role in this country's early development including directing the design and construction of the U.S. Treasury Building, U.S. Patent Office, and the U.S. Post Office. He also designed numerous churches, houses, and monuments along the eastern seaboard. Two of the most renowned are the Washington Monument in Baltimore and the National Monument in Washington , D.C. The latter was an engineering accomplishment of international acclaim and the tallest single edifice in the world at the time. The original "GALLOWS where men were hung up until the 1960's!!!! Joel Clough brutally stabbed his girlfriend to death with a knife. Sentenced to death, he escaped from the prison but was quickly recaptured. He spent his final days in the death row cell known as "the dungeon". Clough was hanged in 1833. Shortly after his death, guards and inmates heard moaning and the sounds of rattling chains from the empty cell. 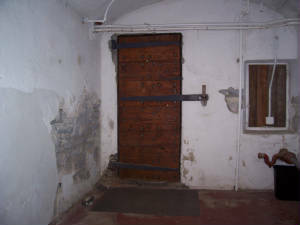 They also claimed to see apparitions and items levitating in the cell. During the restoration of the building in 1999, workers reported strange events such as loud noises, voices, and quick temperature changes. Missing items turned up in rooms the workers had not even entered. These and many other inexplicable events have drawn dozens of paranormal and ghost research teams from across the county to the museum to investigate.